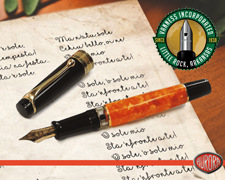 Celebrating the fountain pen everyday. Swag is sent out not just by me but many of the vendors who support Fountain Pen Day as well as Bloggers. They are supplied with swag for giveaways and contests as time and money permits. There is plenty to be had by following on the many social media sites listed at the bottom of the page. There are also many brand specific items that are donated by retailers and or the manufacturers importer. Kenro is a big supporter as has provided many LE journals to give away like the Montegrappa Skull edition and OMAS 90th anniversary edition. I know everyone wants to have the Fountain Pen Day swag and while I have sent out tens of thousands of bookmarks, thousands of stickers and thousands of pins I know getting to everyone is just not possible. This swag has been sent to almost every corner of the world. You can see many of examples of the swag made for each year and show specific bookmarks on the Pinterest page. When I am at shows I make sure to bring bulk amounts to give to the attendees and the rest is given to the vendors. This way I can save on the exorbitant shipping costs. The shipping is one of the hardest hurdles to overcome as they have risen beyond reason. So in light of that and a way to help support Fountain Pen Day I have set up small packages on eBay to offset this. Shirts are listed on eBay and offer world wide shipping. Here I will list some of the handmade Journals and Leather Journal covers. I will update this with new colors of both Journals and Leather Covers as they become available and as others sell out. I have tried to ensure that it works without a hitch but there are always things that pop up. Please let me know if something does not seem right or does not function correctly. At this time I am shipping within the USA only. Shipping rates are set at $3.50 for the journals and $5.00 flat rate after that. Meaning it's $5.00 maximum shipping charge no matter how much you order. Everything is sent 1st Class mail and packed correctly. If I get a bunch of emails asking I will add in a Priority mail option. 30 pages or 60 front and back of the amazing TOMOE River paper. There is also an insert page as the first and last page of the journal that is Sugar Cane paper for a little extra protection and to use as a title page if you like. So you are really getting 64 pages to write on. These are hand made. Cut, stitched and bound with care. They have the Fountain Pen Day logo on the front right corner and the full logo on the back. You can see in the pictures and video how these are bound as well as the strength they have to protect your thoughts and daily jotting. This is for one 2pk of journals in either Royal Blue, Forest Green or Royal Burgundy. ONE ~ Standard Fountain Pen Day pin in matte finish. THREE ~ Bookmarks ~ Fountain Pen Day 2015 version ~ Bookmarks have 90 degree corners but you can have rounded corners if you like. Please let me know in the comments when you order if you want rounded corners. Current stock has been updated and loaded into the system. Reviews of fountain pens and everything in between. This will change each month and is just a link to a friendly vendor.